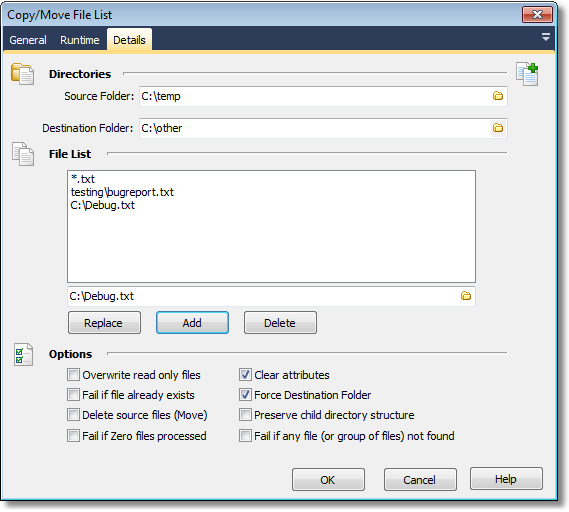 The Copy/Move File List Action allows you to copy move a list of files from one directory to another. WARNING: This action is deprecated and may be removed in a future version of FinalBuilder. Use the Copy/Move FileSet action, instead. This action was written by Jim Gunkel from Nevrona Designs. It makes it possible to provide several different file specs for the files that should be moved/copied. Jim has kindly made this action available to all FinalBuilder users. The source for this action is installed as an example of creating custom FinalBuilder Actions. The Folder where the files will be copied/moved to. Overwrite existing read only Files. Clear the file attributes (Read Only, Hidden, System) during the copy/move. When set, files from subdirectories inside the source directory will be copied into the appropriate sub-folders inside the destination folder. Files located outside the source folder are be copied directly into the destination folder. In the example above, if "Preserve child directory structure" was set, then the file C:\temp\testing\bugreport.txt would be copied to C:\other\testing\bugreport.txt but the file C:\debug.txt would be copied to C:\other\debug.txt. The list of files to be moved/copied from the Source Folder. This can include wildcards. Paths can be local (relative to the source directory) or absolute.